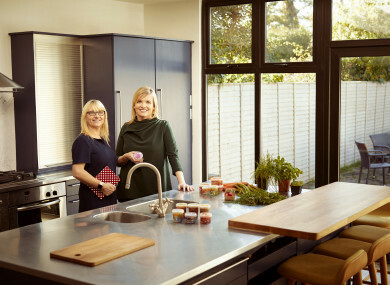 THE NIGHT BEFORE Irene Queally returned to work after having her second child, she was lying in bed exhausted – she had spent the evening batch cooking food for her kids. Nervous about the impact that returning to work would have on the time she’d have to cook for her two little ones, she thought - why isn’t there something easier? When you’re pregnant or breastfeeding, you’re so conscious of what you’re eating. But after that, I found there was a big gap between what I’d eat myself and what was available on the market for babies. The next morning, Queally woke up and couldn’t get the idea out of her head. It took a long time to research and understand this highly competitive market with strong household brands. Parents chose to buy our dishes over the free baby bowl and soon they were coming in and asking ‘can I bring these home with me? Queally realised she might be onto something big. She went to the Local Enterprise Office in Waterford for advice – an organisation that ended up being instrumental in getting her new business Pip & Pear off the ground. “In order to get going, you can only do so much on your own as one person”, explains Queally. The first benefit she got from them was a Business Priming Grant – which allowed her to hire her first employee. She explains that for many in the first year of business, “you just don’t have that money”. The Local Enterprise Office offered the company a variety of free training courses and helped Queally to plan for the future – asking her to complete a full business plan done for the next few years. The first year we won, it was just so exciting. The blind-taste was such a testament to the quality. We were only selling in the cafe at the time. It was here that they met SuperValu who wanted to stock them in selected outlets. By the following May, they had officially launched their product. Pip & Pear has won at the awards every year since. But getting into stores wasn’t so easy. Producing a natural chilled product instead of one that relies heavily on preservatives meant that Queally’s products are found in the fridge, not where parents would naturally look for them in the supermarket – the baby aisle. We’re over in the dairy aisle, we’ve fought hard to sit next to the likes of Glenisk baby yoghurts – the only other place we felt mums would be. Though technically retailers would probably sell more yoghurt, we’re offering something unique and bringing new families into stores. Soon, Pip & Pear attracted attention from Aldi featured them at their baby events and then gave them a full listing in all their stores, thus giving the company a national platform: “Suddenly we could say we’re nationwide. It’s difficult to promote yourself when that isn’t the case.” Last year, they launched 12 new dishes for Aldi’s Mamia range. Tesco followed and Pip & Pear is now stocked in 112 of their stores, along with selected Dunnes and SuperValu outlets. Next year they’ll look to expand to Europe in markets like Belgium, where baby food purchases have been in decline as parents seek to make their own instead. They’ll also unveil a new healthy snacking range for toddlers in 2019. Though Queally’s own kids’ diets are “far from perfect”, she says that her two kids are adventurous eaters and love fish. This is something that she attributes to encouraging them to taste lots of different flavours and textures from such a young age. We’re trying to help parents. Everyone is so pushed for time and there’s so much guilt in parenting. The whole aim was to help other parents tick that box of providing a healthy meal so they don’t have to feel guilty about not always cooking from scratch. My most important piece of advice for getting your business started would be to get in touch with your Local Enterprise Office as soon as possible and avail of as much support as you can through them. The office offers a mentor system, connecting you to a nationwide network of people from similar industries, which Queally says has helped a huge amount. “I had never worked in this realm before so there has been a lot of learning, but we’re so proud of the product we’ve produced” says Queally. Got a brilliant business idea of your own? The Local Enterprise Office will help you get it off the ground, providing expertise and financial support and enabling your business to grow and thrive. If you have a good idea, they can help you to make it happen. Email “'There's so much guilt in parenting': How award-winning company Pip and Pear spotted a major gap in the market”. Feedback on “'There's so much guilt in parenting': How award-winning company Pip and Pear spotted a major gap in the market”.